I try to be a positive role model to my children, I'm always out and about doing some sort of sport, running, swimming, cycling, I want them to see that exercise need not be a chore. I'm not sure if it's really hit home with the older three, the times they have run with me they have got stuck in the mud and their shoes have come off, or they see me heading off for an open water swim when the sky is grey and rain is forecast and shake their heads in disbelief before returning to their computers . Daisy, however, is my biggest supporter. When she is able she loves to cheer me in races, even more so when there are medals to hang up at home. Actually running with Daisy though has always been a bit more tricky. She is completely wheelchair dependent so cannot walk and relies on someone to push her. Her complex regimen of intravenous infusions and catheter care means that most races are out the question as they tend to start at 9am and it's physically impossible to get her up and ready and out of the house. Until recently she only had a standard wheelchair which is not ideal for being pushed in while running. Earlier this summer we were able to order a fabulous special needs jogging buggy thanks to a fundraising drive by my running club. Since it's arrival Daisy and I have enjoyed lots of lovely trail walks around Richmond Park and a few jogs around the park opposite our house. We were really able to put it through it's paces this weekend however as we were invited to participate in the first ever Parallel London Festival in the Olympic Park in East London. Parallel London is an all inclusive running festival with races for everyone, regardless of age or ability. No pressure, it was all about participation. We entered the 5K run and on Sunday morning , following a frantic morning of getting Daisy's meds done and getting her into her wheelchair ready to go, we set off. Daisy was so excited, we didn't have any nurse cover that day so big brother Theo came along as her carer which was a double bonus in her eyes. We cut it fine and arrived just in time for the start of the 5K race. Looking around I got the same feeling as when we had visited the paralympics, here our family was the norm, not the exception. Everywhere we looked there were wheelchairs, walkers, guide dogs, prosthetics - no-one was staring or pointing, it was all about participation. There was a 1K sensory race, a 1K race, a 10K race and of course our event, the 5K. Despite being a bit late to the start there was no pressure, often in big mainstream events the wheelchair athletes are sent off first and we would have missed our start, instead we were sent off in waves and as the race was chip timed we still got an official start and finish time. As we waited to go off in our wave Daisy was waving and smiling at everyone, I have not seen her so animated in a long time. We crossed the start line and we were off! Daisy, being Daisy, wanted to go as fast as possible and overtake as many people as possible, hard work for me pushing a 34kg child and a pretty heavy buggy on a surprisingly undulating course! We had a couple of stops for selfies, to hi-five the marshals and to rescue her discarded socks. We spotted the Olympic Stadium, Velodrome, Copper Box Arena and Aquatic Centre as we worked our way around the course, cheering the other participants as we overtook them and waving to onlookers. I actually felt very choked up, being able to run with Daisy in a race where she was not pitied for being the "special" child among all the able bodied children. It felt so liberating to be on the course with people of all abilities, all just participating in sport and having fun, I could sense that Daisy felt the same way. We could hear the we were close to the finish line before we could see it, everyone was cheering . Normally Daisy would be overwhelmed by the crowds and the noise but she was so happy. Even more so when she got her medal and Tshirt, and the added bonus of a brilliant goody bag, definitely one of the better race goody bags I have received! After the race there was a festival where again, all the important details had been thought through. Rubber matting had been put on the grass to make it wheelchair accessible, there were lots of disabled loos and there was even a chill out zone with sensory room for those people who needed some space and quiet. We headed off to the Music & Performance stage to meet up with our old friends Singing Hands. Anyone who knows Daisy knows how much she loves Singing Hands , she even appears in two of their DVDs, seeing them perform rounded off a perfect day for her. In fact that evening she had a bit of a meltdown as she wanted to do "more running" but in her words next time "Jules push, mummy watch". I was so impressed with Parallel London, yes as with any major event there were a few teething troubles, they would be the first to admit that there could be better signage to the event from the station, but those niggles out weighed the positives. This event had clearly been put together by people who knew their stuff - how to stage a big event, how to stage a race and how to stage an event that was fully inclusive. For us it ticked all those boxes. It was all about participation, I wanted Daisy to know what it feels like to take part in a race and get a medal, it's always been very difficult to make that happen, going to Parallel London she was able to do this. It was about being a little girl doing things that other families take for granted and last Sunday we achieved that. Her self esteem and sense of achievement are currently sky high! 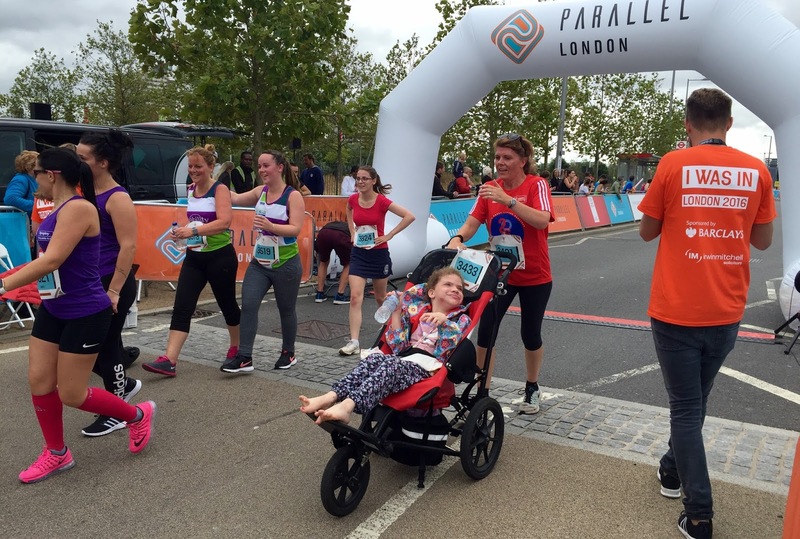 Everyone can participate in sport, given the right support, thanks to the team behind Parallel London for making that happen for Daisy. We are already counting down to next year's race, why don't you join us?